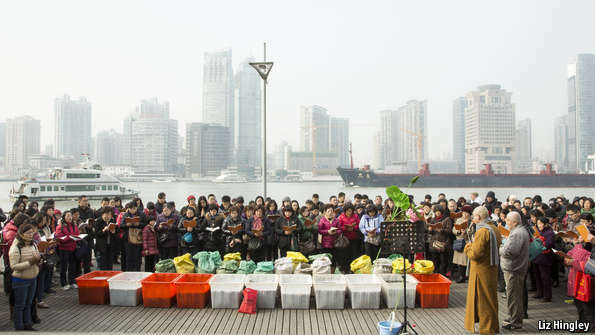 EVERY Saturday morning hundreds of devotees gather by Shanghai’s Huangpu river to liberate fish. Over three hours some 2,000 loach are tipped into the murky waters to the sound of chants. This is fang sheng, or “animal release”, an East Asian Buddhist ritual in which captive creatures are freed. The point is to demonstrate compassion and earn merit. The practice is ancient, though along with everything else, it was condemned as so much superstition under Mao Zedong. Today fang sheng is making a comeback, especially among the young and well-off. Officials estimate around 200m fish, snakes, turtles, birds and even ants are released each year—though no one really has a clue. Fang sheng associations can rake in around 1m yuan ($157,000) in annual donations. For some monks it has become a racket. The greatest price, however, is paid by the animals themselves and the ecosystems from which they come and into which they go. A vast and mainly illegal wildlife trade caters to the demand for animals. Figures are hard to come by, but one paper estimated that in Hong Kong two markets sold over 630,000 birds a year, most destined for fang sheng. Many animals—perhaps half of all the birds—die during capture or transit from stress, disease or mishandling. Nor does using reared or exotic species help. They create havoc in local ecosystems. Zhou Zhuocheng, chairman of China’s main body on aquatic ecology, cites the case of the mosquito fish from North America, a popular fish for fang sheng. It feeds on the eggs of the native Japanese rice fish, causing the latter to disappear completely in some areas. To add to the grimness, many animals, once released, are hoovered up and sold again to fresh devotees. Animals that do not survive the trauma are often sold as food. Wang Tianbao, a 26-year-old programmer and evangelical Buddhist, admits that paying for animals that have only recently been released is “a waste of money”. Yet still he is prepared to spend oodles on fang sheng, through whose associations he can disseminate Buddhist information and reach new followers. He says he first practised fang sheng as a student, releasing two turtles that cost him 98 yuan, his food budget for three weeks. Today he spends 5,000-7,000 yuan, or about 5% of his annual salary. There may just be better ways to earn merit.